To be honest, I was pleasantly surprised to see Shan Masood perform so well in the Test series against South Africa. What was really impressive from Shan was the amount of work he had put in which has really helped him improve his technique as we saw in all three matches that he played in the Test series. It was obvious to me that he was better prepared for this series than many others and he knew exactly what he had to do and that is why he kept on meeting success in South Africa and it's quite possible that staying away from some of Pakistan's coaches really helped his cause. Shan was managing the bounce really well against some quality bowling, and seemed to have overcome a problem of his where he would be nicking the ball, especially off the back-foot to the slips or the wicket-keeper. Instead we saw an assured Shan at the crease who knew where his off-stump was and also when best to leave the ball instead of fishing at it. He also seemed happier to score on the onside with an occasional punch through the covers, a cut shot or a straight drive which to me is a great sign of better things from him in the future. One must recognize the fact that nowadays the first tour of South Africa or Australia is a difficult one for any player who is going there from the sub-continent. The tour of West Indies in the old days used to present similar challenges. But the fact is that players with good technique are always successful in such conditions, especially in their first tours. From what I saw of Imam-ul-Haq, he was off-balance when defending the ball and almost used to walk into that shot. His back-lift and manner in which he defends deliveries are all shortcomings which should have been spotted by our coaches. In his defence, I would say that Imam was simply not given the right information and was not worked with by the coaches. He was therefore not able to overcome his deficiencies and those weaknesses in his batting were exposed by the opposition. Let’s be honest and admit that Imam does have the right temperament for the job and does have the ability to stick it out and stay there, but he really needs to improve his technique. Grant Flower’s presence and vast experience as batting coach in the Pakistan set-up should have been reflected in better performances of the players. Unfortunately, I haven't seen that happening even though he has been with the Pakistan side for a long time now. 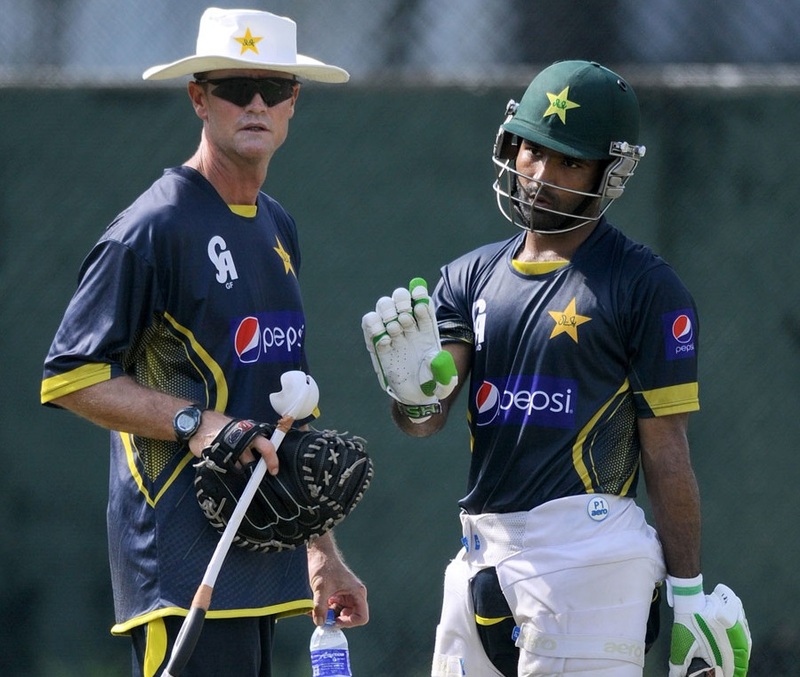 I have not seen any improvement in the Pakistani batsmen with Grant Flower as batting coach. What we should be seeing improving among our players is the technique and the basics of the game with his guidance but that has not been the case and is a cause of concern for me. Take the example of Azhar Ali who seems to be getting out in the same manner every time. Why has he not been shown how to overcome his problems and given the right guidance by the coaching staff? This is very disappointing. Look, I am not asking Grant Flower to teach our players to hit big sixes or to crack 20-ball fifties but what we do want from him is to improve the defensive techniques of our batsmen. As a player, Grant Flower knew how to leave the ball and to occupy the crease, but we did not see that knowledge reflected in the performances of our batsmen. Fakhar seems to know only one way to bat which is to take on the bowlers. There are certain strokes he plays very regularly which aren’t that effective and present a huge peril when played in South African conditions. I feel that more than Fakhar, it’s the selectors who should have known about his limitations and also the coaches should have recognized these issues. If Fakhar was a must for this tour, then they should have worked with him on his technical deficiencies and helped him out and his weaknesses should have been ironed out before the tour of South Africa. It’s up to Fakhar now to work hard and come back stronger than before but it really is dependent upon the coaches to guide him and to give him the right information. I feel that he has not been told about defects in his batting as yet and has not been given the solutions to those issues. We seemed to have chosen our teams based on reputation during this series and it seems that not much thought was given to who were actually the best players for the matches. When this did not work out and we were defeated in the first Test, we panicked and made changes to the team which caused us further problems and that continued to the end of the series. If Yasir Shah was to be played in the Test series in South Africa, then the team management should have known how best to utilize him. We all know that Yasir has struggled in Australia and in away conditions in general, so why has he not been spoken to and asked to fix his issues? He has over 200 Test match wickets and so is not lacking in skills or talent. A change in approach was needed in South Africa for Yasir to be successful. In those conditions, you need to bowl with a different line, length and angle. But he wasn’t guided properly and it seemed that he did not know about what the best way to bowl on such surfaces was, and he was left to his own devices on this tour. He was probably asked to do what he could do, and no real plan seemed to have been provided to him. I am not saying that Shadab Khan should have been preferred over Yasir Shah, however, we all saw that Shadab got more success than Yasir and the reason for that was he was bowling with the right speed and attacking the stumps, and also managed to get more turn than Yasir. Watching Shadab bowl so well, I am guessing that the Pakistan coaches must have been ruing the fact that they didn’t ask Yasir Shah to bowl differently as well. Make no mistake that Babar Azam for all his talent has some technical deficiencies. However, what he showed all of us was his positive intent and that was great to see regardless of the fact that he came into bat at times when the ball was old and wasn’t doing that much. In the back of his mind, Babar knew that the bowler would eventually bowl that unplayable delivery to him at any time given the sort of pitches the matches were being played on. But his philosophy seemed to be that he would get to the bowler before he got to him and take the game to the opposition and I am glad that this style of play worked for him. What Babar showed to all of us was that the fact that a good attitude can bring about some huge benefits for himself and his team. Babar Azam's positive intent at the crease was an example for all other Pakistan batsmen to follow. There has been a lot of criticism regarding Azhar Ali and Asad Shafiq and their place in the team is now being questioned. My view is that the best players in the world go through bad times and struggle from series to series, but you have to stick with your experienced players. Look at the case of Hashim Amla who has been playing for a longer period of time than say, Azhar Ali. He has been struggling as of late, but he was still favoured by the selectors due to his immense experience as they knew that he was only one good innings away from regaining his form. So, he was given the backing and he worked hard and justified the vote of confidence in his abilities by South Africa coach Ottis Gibson. The coach was confident that despite Amla’s below par form, they would work with him and hopefully he would come good, and that is what happened as we saw in the series. So, let’s not talk about dropping such good players and if you do wish to drop them, think about the options you have to replace them and you will find we don't have many. Also, with the fast approaching World Cup in England, I believe we should not talk too much of large-scale changes as teams thrive on confidence and stability and now would not be a time for upheavals. If there is a change required, it needs to be done in the way work is being done with our players within the Pakistan team. What we need to do is to ask the coaches about their role and also question the think-tank about their roles. Were they not aware that Pakistan would be touring South Africa and that the batsmen we have at our disposal needed to improve their technique to perform away from home? This appraisal exercise involving coaches, selectors and players must take place in private instead of making it a big public show of things as it seemed from some recent news reports. We need to have this conversation behind closed doors so that an effective strategy can be chalked out without pressure from the outside. I am not asking for anyone to be fired or sacked but questions should be asked and the coaches need to be held accountable for Pakistan's recent performances in Tests. If the coaches are to be retained, they need to raise their game and I will repeat again that throughout the Test series, we did not see any positive influence of Grant Flower which is very disappointing. For Pakistan to do well in this series, they will need to aim to score at the least 250 or above. I said something similar before the start of the Test series as well that whoever scores close to 300 runs consistently would win the series and that turned out to be true. The Pakistan side should not be thinking about scoring 300s in ODIs but instead, should be aiming for 250 and then hope to defend them during this ODI series through some good bowling. One must accept that the Pakistan batsmen would be slightly demoralized from their performances in the Test series, but this is the time for the players to show some character. Yes, one can have failure once in a while, but one cannot take that to the next game or series as this is part and parcel of the game. Pakistan players have to rise up and take the game to the opposition.